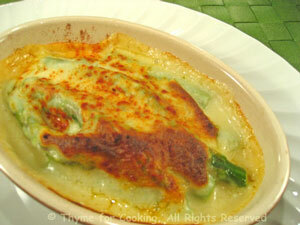 Asparagus Gratin, Thyme for Cooking easy spring, gourmet first course. Quickly blanched asparagus are finished in the oven with a light cheese sauce. Can be made ahead and baked at the last minute and easily doubled or tripled for a buffet or party. I put them in small, individual casseroles. Trim asparagus, trim to fit baking dish if needed. Bring a medium pan of water to boil and blanch the asparagus for 3 minutes, 4 minutes if very thick. Remove from heat and add cheese, stirring well. Arrange asparagus in 1 or 2 baking dishes, just large enough to hold the asparagus. Spoon the cheese sauce over the top, sprinkle with paprika and bake, 400F (200C) for 10 minutes, until the sauce is browned and bubbly.